After a decade as a Trustee and seven years at the helm as Chairman at St Luke’s Hospice Plymouth, Stuart Elford will be stepping down in May and passing on the baton to Christina Quinn. It will be the end of an era for Stuart, who is Director of Operations and Development at GA Solicitors as well as a Director of the Devon Chamber of Commerce. During his tenure with St Luke’s Stuart has faced a number of challenges, but even more so, a number of highlights and has played a crucial part in making St Luke’s what it is today. Stuart will be passing on the role of Chair to Christina Quinn, who will be officially taking over on 23 May. Christina has a wealth of knowledge and experience in the health and social care sector. 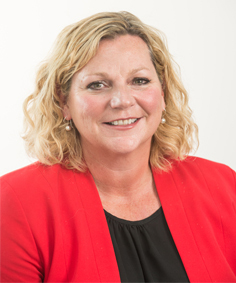 Originally from London, she trained as a nurse at St Bartholomews Hospital, before moving to the South West where she has since worked for the Plymouth NHS Trust and is currently Director of the South West NHS Leadership Academy. Throughout her career, Christina’s key interests have been leadership and the impact of leadership in outcomes for patient care. In her current role she is responsible for shaping leadership development interventions at a national and regional level. Having grown up in London, one of the main attractions for moving to this part of the country was Christina’s childhood longing to live by the sea. With hobbies including open water swimming and diving, she has truly embraced the lifestyle down here. Becoming Chair is a role that Christina is proud to be taking on. “St Luke’s has always been an organisation that has been held very dearly by the city”, she says. “Having experienced St Luke’s through my position within the local healthcare profession, it is clear that it is an example of a really fantastic organisation, not only in how the staff themselves feel about it, but through its work within the community as a whole. Christina will officially be taking over as Chair of the Board of Trustees on Tuesday 23 May. We wish her all the best in her new role.